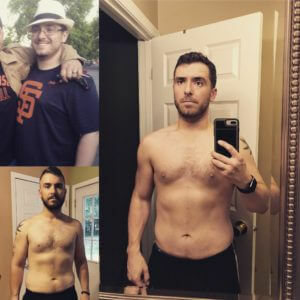 Grant uses Redy to overcome his weight troubles and maximize his efforts. I have battled obesity my entire life and I’ve always felt self-conscience of my body. I’ve dreaded going to the beach or hanging out at a pool because I was ashamed of my body and I’ve hated taking off my shirt. Over the last 10 years I’ve lost weight and put it back on too many times to count. Always so frustrated that I lacked the discipline to keep it going. Four years ago I started my career as a field producer filming hunts around the world. I knew that this job would require me to get in shape and stay in shape so I could keep up in the mountains… but even so I struggled to stay in shape and keep weight off. I tried fad diets and I worked out, but I would always fall off the wagon. Two years ago I was introduced to Donnie Howell at Redy Nutrients as they started sponsoring the TV show I filmed. Donnie set up me up each of the products that Redy offered and took the time to give me a workout plan and provide me a nutrition guide. I knew that this was an opportunity not to be wasted and was my motivator to kick it up a gear. This last year I lost 35 lbs and I’m now in the best shape of my life, but I’m not done yet. I’m no longer dieting, I eat healthy because I know it’s best for my body. I use all the Redy supplements to maximize my workout efforts and the results speak for themselves. I can’t thank Donnie enough for his help and encouragement throughout the process.